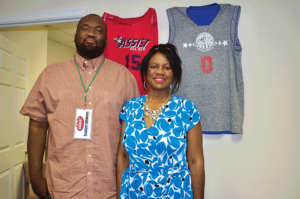 A mother and son duo best known for their ASSIST Student Athletes program that aids students with getting sports scholarships is opening a summer camp for kids ranging from ages six to 14. William Carter and his mother, Chana Carter, run and operate the ASSIST (Athlete Scholastic Support Initiative for Securing success Tomorrow) Foundation, a 501 (c)(3) non-profit organization that was founded in 2003 and has helped over 1,700 youths obtain scholarships. Camp ASSIST will have two locations – Chester (behind Elizabeth Scott Elementary School) and downtown Richmond – and it is designed to help campers develop and embrace positive self-esteem, courage, community accountability, and academic awareness. The camp will offer a Higher Learning program – which consists of advanced mathematics, creative arts and design, culinary art and cooking, earth science,and gardening – and campers will have their choice of two subjects and receive mentorships from specialists in their chosen field. William Carter, who is the executive director and founder of the ASSIST Foundation, said he wants the camp to provide children with an enjoyable experience and that having a mentor for the campers will help take them to the next level. The idea to start Camp ASSIST came from Chana Carter, who said her focus is to provide a safe and productive environment for children. The camp offers nine sessions, and it runs from June 26 to August 25. Two hundred children are expected for each session, but Chana Carter said there could be as many as 500. Chana Carter, president of the ASSIST Foundation, said children should be able to have a good time without fear of being bullied, and he stressed the importance of community involvement. William Carter said ASSIST plans on having guest speakers from the organization who went to college and are playing there, in the NBA and in the NFL to give the campers the mentor aspect that they need. He said campers don’t have to be athletes and that the camp provides resources for whatever career path a camper may choose. For Chana Carter, she just wants the children to feel good about themselves and prevent them from being involved in a life or crime or seeing violence on television. She said it is the best feeling in the world to see their alumni leading successful lives.